The Mother of All Double Tops? So here we sit, with the S&P 500 at 1,503, which is withing “spitting distance” of the 1,561 high reached back in October, 2007. 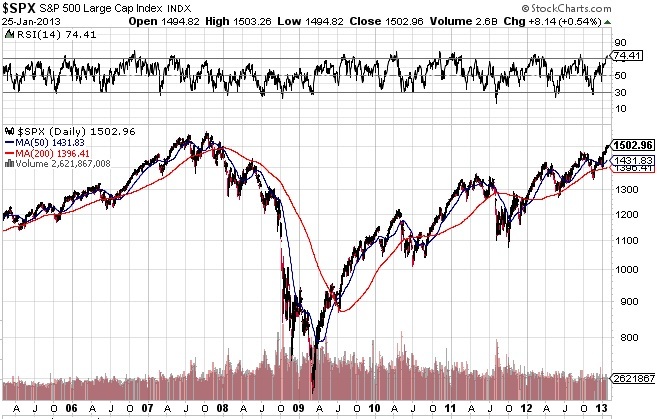 As you can see by glancing at the chart (if you squint really hard), in July 2007 the S&P 500 peaked at 1,552 before correcting over the summer and early fall, and then charged to the all time high in October, 2007. That turned out to be the top, and that was it. By March of 2009 we were at 683, a drop of over 56%. But, since then, the direction has been up, with a few pronounced corrections along the way. If you believe in technical analysis, you believe we are approaching an important inflection point. If the S&P 500 can close above 1,561 for a day or two, that would indicate a new high. A new high means that every investor that “bought the index” is sitting on a profit. There is no overhead resistance. The market can run, without the worry that investors will sell to “get out even”, as they do the entire way up. A central theme of this blog is that the way to make money is to “buy high and sell higher”, meaning don’t try to pick the bottom; wait until the market (or the stock) makes new highs, and then start buying. If a stock fall from $10 to $8, that may appear to be a buying opportunity, but how do you know it won’t fall to $6? Or $4? If, however, you wait until that stock goes back up over $10, everyone who owns it owns it at a profit, so they will be more inclined to “let their profits run”. That’s how the human mind tends to work (assuming investors are rational, which is another discussion for another day). For the last five years many investors have sat on the sidelines. The crash in 2008 and 2009 scared them. Many got wiped out; many more had substantial losses, so they took whatever dollars they had, and went to the sidelines. Sitting on the sidelines earns you essentially zero interest at the bank, or in whatever fixed income investment you have chosen. That’s fine for a period of time, but when you read headlines like Dow and S&P at Five Year High, you start to forget about the crash, and start to consider that perhaps it’s time to get back in to the market. Five years is a long time to earn nothing. FedHead Bernanke has printed money like crazy for five years. We are awash in cash. Some of that cash has found it’s way to the markets, so even though the economy by conventional measures like unemployment remains weak, the money printing has driven the market higher. A higher market drives a market higher, as investors on the sidelines jump in. Now the market is rising not just because of money from The Bernank, but also from real money from real people. The snowball gains steam. Logically, this will have one of two outcomes. First, it’s possible that the market will continue to increase. We hit a new all time high this week or next, which is trumpeted with much fanfare on CNBS and other outlets, and that drives the market even higher. It’s also quite possible that we are headed for a crash, as accurately foreshadowed in the now legendary video on YouTube filmed by Sidewinder, and viewed over 116,000 times since January 15. Why could the Sidewinder video be prophetic? 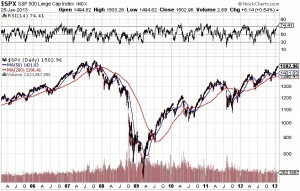 For a number of reasons, not the least of which is that the RSI on the SPX is 74.41, which is very overbought, and higher than it was at the top in 2007. That certainly increases the possibility of a crash. If we don’t make a new high the technicians will interpret that as a double top, and that’s not good. Or, quite possibly, investors will wake up and realize that this current bear market rally is built on funny money. Who knows? Not me. I’ve added to my gold holdings this week, and will watch with interest the saga of AAPL – Apple and RIM.TO – Research in Motion this week as one made a 52 week low, and the other has gained 50% in short order; I don’t own either, but it’s an interesting fight. Beyond that, I’ll remain on the sidelines, and watch the action. Thanks for reading; perhaps we’ll have a clearer picture next week (or a truck crash).